WELCOME TO PLUS ULTRA BOOKS! Feel free to browse our selection of titles, which will expand as time goes on. 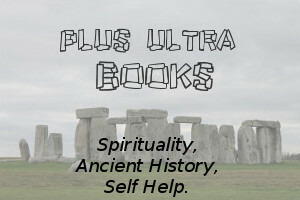 Plus Ultra, which means: '(there is) more beyond', is interested in supplying works from a variety of authors, which can push the boundaries of spirituality, self-help, ancient history, as well as mysteries, archaeology, and arcane nowledge, within a compelling, fun and accessible format. Thank you for your support! We encourage your book-buying patronage, and aim to be selective in providing some truly exciting and paradigm-shifting titles in future, for your reading enjoyment! I started this small publishing label with a view to creating fun and quality books on ancient mysteries and spirituality with a view to help talented authors to bring their work to the world market through new online publishing and marketing methods, but with an insistence upon quality. This would include neglected great works of past geniuses, which may often and surprisingly be re-interpreted through new paradigms. Our human lives, and the faculties we are blessed with, are incredible and amazing. It sounds corny, but there is always a greater reality which lies beyond our understanding, awaiting its discovery.